When people first walked across the Bering Land Bridge thousands of years ago, dogs were by their sides, according to a study published in the journal Science. Robert Wayne of the University of California, Los Angeles and Jennifer Leonard of the Smithsonian Institute used DNA material -- some of it unearthed by miners in Alaska's Interior -- to conclude that today's domestic dog originated in Asia and accompanied the first humans to the New World about 10,000 to 15,000 years ago. Wayne suggests that man's best friend may have enabled the arduous journey from Asia into North America. "Dogs may have been the reason people made it across the land bridge," said Wayne. "They can pull things, carry things, defend you from nasty carnivores, and they're useful to eat." Researchers have agreed that today's dog is the domestication of wolves thousands of years ago. Before this recent study, a common thought about the precise origin of North America's domestic dog was that Natives tamed local wolves, the descendents of which now live with people in Alaska, Canada, and the Lower 48. Leonard and Wayne's study suggests that domestic dogs predate humans' arrival in the New World. 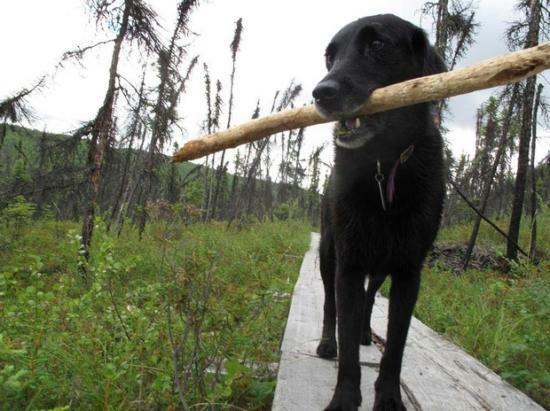 Frozen dog remains from a Fairbanks-area gold mine helped the scientists reach their conclusion. Leonard, an evolutionary biologist, extracted DNA from 11 bones of ancient dogs that were locked in permafrost until Fairbanks placer miners uncovered them in the 1920s. The miners donated the preserved bones to the American Museum of Natural History in New York City, where they remained untouched for more than 70 years. After borrowing the bones from the museum, Leonard and her colleagues used radiocarbon techniques to find the age of the Alaska dogs. They found the dogs all lived between the years of 1450 and 1675 A.D., before Vitus Bering and Aleksey Chirikov were the first known Europeans to view Alaska in 1741. The bones of dogs that roamed the Fairbanks area centuries ago should therefore be the remains of "pure native American dogs," Leonard said. The DNA of the Fairbanks dogs would also reveal whether they were the descendents of wolves from North America. Along with the Fairbanks samples, the researchers extracted DNA from bones of 37 dog specimens from archeological sites in Mexico, Peru, and Bolivia that predated the arrival of Columbus. In the case of both the Alaska dogs and the dogs from Latin America, the researchers found that they shared the most genetic material with gray wolves of Europe and Asia. This supports the idea of domestic dogs entering the New World with the first human explorers who wandered east over the land bridge. Leonard and Wayne envision dogs of different genetic lineages joining the first humans that ventured across the Bering Land Bridge to slowly populate the Americas. Wayne thinks the dogs that made the trip must have provided some excellent service to their human companions or they would not have been brought along. "Dogs must have been useful because they were expensive to keep," Wayne said. "They didn't feed on mouse pellets; they fed on meat, which was a very guarded resource."